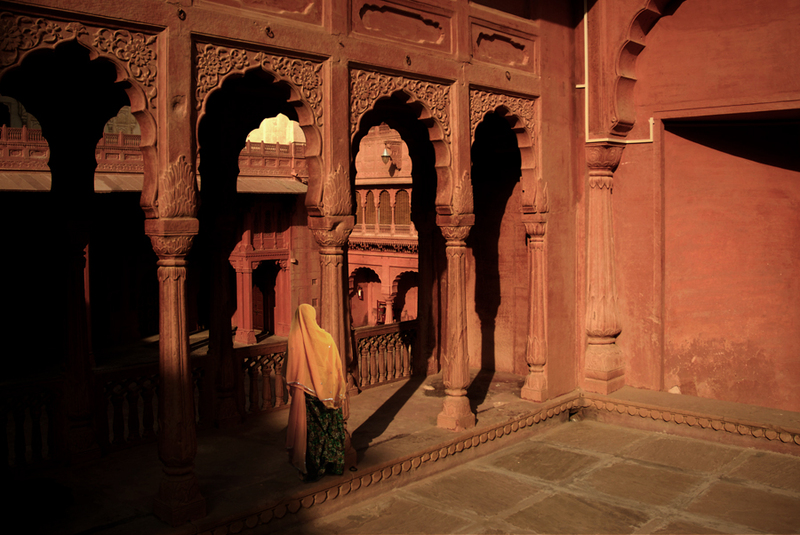 In this thirty-sixth archive story by Kristian Bertel, we are visiting the Junagarh Fort situated in Bikaner in Rajasthan, India. Junagarh Fort is a fort in the city of Bikaner, Rajasthan, India. The fort was originally called Chintamani and was renamed Junagarh or 'Old Fort' in the early 20th century when the ruling family moved to Lalgarh Palace outside the fort limits. It is one of the few major forts in Rajasthan which is not built on a hilltop. The modern city of Bikaner has developed around the fort. Junagarh Fort is located in the arid region of the Thar Desert of Rajasthan bordered on the northwest by the Aravalli range, a range of mountains in western India. Part of the desert area is in Bikaner city, which is one of the three desert triangle cities, the other two cities are Jaisalmer and Jodhpur. The name of the place where Bikaner city with its forts was established was then known as Jungladesh. The structures built within the Junagarh fort are the palaces and temples, which are made of red sandstone and marble. The palaces are described as picturesque with their assortment of courtyards and balconies. The fort, the temples and the palaces are preserved as museums and provide insight into the grandiose living style of the past Maharanas of Rajasthan. With its seven gates the fort contains several palaces, pavilions and many temples of Hindu and Jain religions, the earliest dated to the 16th century. The Junagarh Fort and its temples and palaces are preserved as museums and provide insight into the grandiose living style of the past Maharanas of Rajasthan. Formerly the capital of the princely state of Bikaner, the city was founded by Rao Bika in 1486 and from its small origins it has developed into the fourth largest city in Rajasthan. As a photographer and traveler in India a visit to this fort in Rajasthan is amazing. These buildings depict a composite culture, manifest in the mix of architectural styles. The fort complex was built under the supervision of Karan Chand, the Prime Minister of Raja Rai Singh, the sixth ruler of Bikaner. Construction of the walls and associated moat commenced in 1589 and was completed in 1594. It was built outside the original fort of the city, about one point five kilometres from the city centre. Some remnants of the old fort are preserved near the Lakshmi Narayan temple. Historical records reveal that despite the repeated attacks by enemies to capture the fort, it was not taken, except for a lone one-day occupation by Kamran Mirza. Kamran was the second son of the Mughal Emperor Babur who attacked Bikaner in 1534, which was then ruled by Rao Jait Singh. The large fort precinct is studded with palaces, temples and pavilions. A major feature of the fort is the stone carving done in red and gold colored sandstones. The interiors of the palaces are decorated and painted in traditional Rajasthani style. Several types of architectural style are discerned in the fort complex and hence it is called a true depiction of composite culture. The earliest style is of Rajput architecture, defined by Gujarati and Mughal architectural influence reflecting the association with Mughal rulers, the second type is of semi-western architecture reflecting British influence and finally the revivalists Rajput architecture that evolved particularly during the rule of Maharaja Ganga Singh. Only the most representative of all these architectural styles are on display for visitors. Thus, the unique monuments on display in the Junagarh Fort represents sixteen successive generations of the rulers of Bikaner, starting from the end of the 16th century. Maharaja Rai Singhji Trust has been set up by the 'Royal family of Bikaner' with the basic objective to showcase the fort with professional inputs in various areas and to improve the experience for visitors. Another objective is to promote education and research scholarships, cultural activities, setting up of libraries and integration with other such trusts. "- The Junagarh Fort is a well preserved piece of history and it contains many artifacts and items which would have been used in various ways over history. There is a tremendous sense of history there and you really get a feel for a once powerful empire. Junagarh Fort is the most magnificent example of architecture and great center of art. The present fort is a composite structure, the result of intense building activities of many rulers through four centuries and one of the precious gems of Indian architecture in the midst of the Thar Desert", the photographer says. India is a land full of stories. On every street, on every corner and in the many places in India, life is rushing by you as a photographer with millions of stories to be told. In the archive story above, you hopefully had a readable insight in the story that was behind the photo of an Indian woman at the Junagarh Fort in Bikaner. On this website of Kristian Bertel | Photography you can find numerous travel pictures from the photographer. Stories and moments that tell the travel stories of how the photographer captured the specific scene that you see in the picture. The photographer's images have a story behind them, images that all are taken from around India throughout his photo journeys. The archive stories delve into Kristian's personal archive to reveal never-before-seen, including portraits and landscapes beautifully produced snapshots from various travel assignments. The archive is so-far organized into photo stories, this one included, each brought to life by narrative text and full-color photos. Together, these fascinating stories tell a story about the life in India. India, the motherland to many people around the world, a land of unforgetable travel moments. The archive takes viewers on a spectacular visual journey through some of the most stunning photographs to be found in the photographer's archive collection. The photographer culled the images to reflect the many variations on the universal theme of beauty and everyday life in India. By adding these back stories the photographer's work might immensely enhanced the understanding of the photographs.